The current political climate might be unfortunately tinged by partisan politics, but that doesn’t mean new points of view cannot emerge. A healthy society needs people who ask questions, challenge the norm and explore new ideas. This entry was posted in Definitions, Groups, Politics and tagged atheism, Buddhism, Catholic, Christian left, LGBTQ, Republicans on August 3, 2017 by Kate Harveston. About once a year or so, Justice Antonin Scalia gets in front of a Catholic school assembly and tells the students that there is no constitutional tradition that says the state must be neutral on religion or free of religion. At least he is consistent. He is consistently wrong about separation of church and state. This entry was posted in Courts, Entanglement, History, Myths, Politics and tagged 1st amendment, atheism, ceremonial deism, church and state, Justice Antonin Scalia, US Supreme Court on January 3, 2016 by Doug. 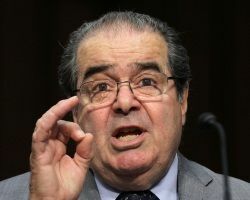 Is Justice Scalia Warming To Separation Of Church And State? Justice Antonin Scalia, one of the members of the conservative block on the United States Supreme Court, gave a speech Wednesday where he seemed to be supporting the separation of church and state. Which is odd because he has been one of the justices who wants to limit the scope of the 1st amendment so narrowly that it really means nothing. Is Justice Scalia warming to separation of church and state? This entry was posted in Courts, Entanglement, History, Politics, Religious Intolerance and tagged 1st amendment, atheism, ceremonial deism, church and state, Justice Antonin Scalia, US Supreme Court on October 2, 2014 by Doug. The plaintiff in the precedent setting US Supreme Court case, Town of Greece v. Galloway, recently developed and adopted guidelines in choosing the person or people who could give invocations at the start of their meetings. Unfortunately it looks like the town ignored the courts prohibition on discrimination. 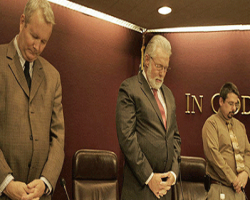 The guidelines seem to exclude the nonreligious from being chosen to lead their pre-meeting invocations. This entry was posted in Courts, Entanglement, Politics, Religious Intolerance and tagged atheism, ceremonial deism, church and state, legislative prayer, religious bigotry, Town of Greece v Galloway on August 25, 2014 by Doug. Today is Religious Freedom Day and President Obama issued a Proclamation to honor the day. The text included atheists as part of the religious diversity and cultural fabric of the United States. He also mentioned the important thing isn’t someone’s faith but that we all should support freedom, equality, justice, and separation of church and state. This entry was posted in Entanglement, History, Positive, Religious Intolerance and tagged 1st amendment, atheism, church and state, equality, National Religious Freedom Day, President Obama, religious freedom, Thomas Jefferson, Virginia Statute for Religious Freedom on January 16, 2014 by Doug. The student freethought group Secular Student Alliance (SSA) is holding their annual SSA Week to both celebrate the work their affiliates do and to raise money to continue the outreach to college and high school students. During the week some bloggers and other online voices will be posting special content to ask people to donate to the group. The SSA does special work and needs your support so please donate if you can. This entry was posted in Groups, Politics, Positive and tagged atheism, college, Freethought, fundraiser, public schools, Secular Student Alliance, SSA on April 29, 2013 by Doug.